Hyperhidrosis is an overproduction of sweat from the axillae, palms of hands or soles of feet. There are two distinct types of sweat glands which respond to either heat or emotion. Those responsible for heat adaptation are distributed all over the body, except for the palms and soles. The sweat glands in the axillae are under the control of both heat and emotion. Hyperhidrosis is probably an abnormal response to emotional stimuli and may be limited to the axillae or to the extremities but occasionally both areas are affected. In pathological hyperhydrosis visible sweat, wet clothes and a clammy handshake are all common. This can be embarrassing for the patient and also can interfere with work and personal relationships. Your doctor will assess which kind of hyperhidrosis you have. You might need a blood test for diabetes, thyroid overactivity or other conditions. Surgical treatment can cure some people but generally is associated with potentially severe side effects so is generally avoided. The aim therefore is usually to control the symptoms. This is a strong preparation of aluminium chloride, mostly used under the arms but can be used for the hands and feet. It does control excessive sweating but can cause excessive irritation to the skin and may have to be discontinued. It is best to avoid soap based products and use an emollient instead. This is an exciting new treatment for axillary hyperhidrosis. This delivers radiofrequency through needles under local anaesthetic which seems to inactivate the sweat gland causing a massive reduction in sweating. 3 treatments are needed in total and some studies are claiming total remission after this. This will be of huge interest to many of our long-term sufferers as it may eliminate the need for twice yearly Botulinum toxin. This can be injected into the skin in very small carefully controlled doses to block the action of the nerves that control the sweat glands. The effect usually lasts between 3-6 months but some people report control for up to 12 months. This is the most popular treatment for Hyperhidrosis at our clinics. 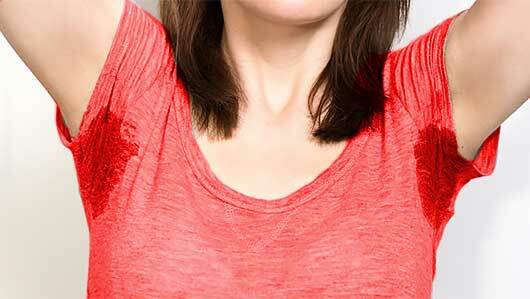 Try to avoid stressful situations that trigger hyperhidrosis. Alcohol and spicy foods can also can worsen hyperhidrosis. Loose cotton clothing and leather soled shoes may be beneficial. Absorbent under layers like a t-shirt can help and also you may need to bring a change of clothes or socks with you to work etc. It is beneficial to have several pairs of shoes; it may take a few days for one pair to dry out.